What beautiful racetrack and facility! We had perfect weather and crowds estimated at 10,000 for the motorcycle festival weekend. The track’s hilly terrain creates a few blind spots, while the 3 looong straightaways challenge racebikes as few courses anywhere do. One of these long, but kinked straights hurtles the racers through a lush forest at top speed…it’s enchanting. 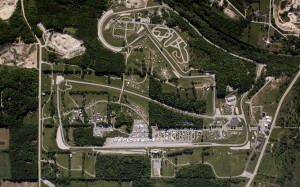 The Road America Race Track in Wisconsin was built in 1955, carved out of the glacial Kettle Moraine area to fulfill the local need for speed when the state banned racing on public roads. Over the years this course has challenged the world’s best racers, and this past weekend was no exception. There were 4 eMotoRacing entrants for the 2 round series held at this grueling, high-speed 4 mile road course. Dave Sadowsky, former Daytona 200 winner, had a new custom rear shock by Nitron fitted to his Brammo Empulse R.
Secondly, Andrew Cowell, AHRMA’s race school instructor, fielded another Brammo with new Bridgestone DOT race tires mounted and ready for action. New to the series is AHRMA Middleweight Superbike veteran Scott Signorini, who recently took delivery of an Empulse R that sports lightweight racing wheels, and a few other nice bits. Scott was excited to compete in his first eMotoRacing event. Arthur Kowits with his trimmed Brammo TTX. Lastly, myself, with my Brammo TTX which is fitted with substantially the same motor, controller, and batteries as the other entrants…but the bike has been lightened and trimmed down for racing. eMotoRacing heads to a tight and technical course at Grattan Michigan next weekend, where racebike advantages are secondary to rider daring and skill. But, this week in both races at Road America, the lighter and sleeker TTX was too much for the rest of the field. These same competitors, plus another new entrant to the field will test each other next weekend at Grattan, Michigan, where the top podium spot will be fiercely contested.